Our private jet to Zimbabwe. It’s not very often I fling myself to Africa to unplug but, when it happens, I make it worth the journey — that’s why I chose to visit Zimbabwe. This Southern Africa country with a population of 14 million has been on everyone’s radar recently, and with good reason: Robert Mugabe, the country's president (uh, dictator) is GONE. Zimbabwe is destined to flourish with tourism, currently offering intimate safari adventures that woo travelers looking for more privacy, uniqueness and a touch of luxury. There's also Victoria Falls, which recently opened it's $150 million airport. I wrote about my experience in both destinations for Travel Age West, which you can read here, but also below. While many U.S.-based tour operators sell Zimbabwe, I chose to travel with Pique Travel Design, a travel consultancy with excellent ties to the country thanks to its exclusive partnership with Blessing Munyenyiwa, managing director of Zimbabwe-based company Love For Africa. Munyenyiwa has personal relationships with the lodges as well as encyclopedic knowledge of the country’s best assets, considering he worked in tourism there for decades (including many years at Wilderness Safaris, a reputable safari ecotourism operator). 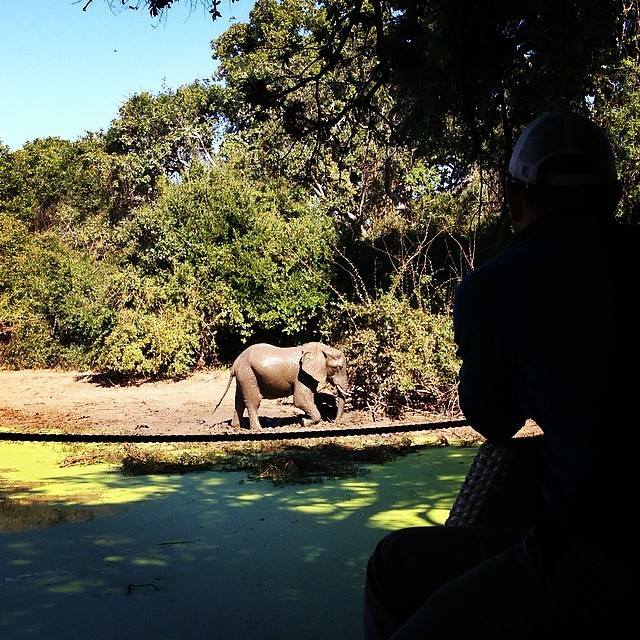 Here are three amazing safari lodges I experienced in Zimbabwe! Zimbabwe is home to dozens of top safari lodges, though I wasn’t surprised that I was booked at Kanga Camp in Mana Pools National Park. The game viewing is so prolific right on property that there really is no need for a requisite game drive (though it’s highly recommended!). In fact, the watering hole, or “pan,” is the only water source around this neck of the terrain for miles, so animal activity is abundant. Elephants, baboon, exotic birds and impalas were ever present throughout the day, while the cackle of hyenas exploded at night, creating the soundtrack for a true safari. At Kanga Camp, you are literally in the middle of all the action. Kanga Camp opened not too long ago in 2009, yet it still received a major renovation three years ago that improved its facilities. The rustic, six-tent lodge is completely unbound with no-frills, bare-boned amenities. Canvas tents have zip-up flap doors; solar paneled energy for low-lit room lanterns; no televisions, mirrors or phones; and a fenced-off bathroom that is exclusively outdoors (yes, even the toilet). Nonetheless, it’s a far cry from the backpacker variety of lodge considering its organic soaps, gourmet meals that include homemade pastas and breads and spectacular wildlife viewing from virtually any perspective. Every tent has an outdoor patio with front-row seats to the pan, though most guests lounge at the main lodge equipped with a plunge pool and al fresco bar. If you can peel yourself from the spectacle, the morning and late afternoon game drives are true adventures. Even from Kanga’s own private airstrip, I was whisked away by Bono, the game driver, who immediately spotted a pack of wild dogs chilling out under the shade of a tree. While it’s no Big Five, the sighting is rare: Approximately 5,000 wild dogs exist in the entire continent. This elephant was just 100 feet from where we were having cocktails at Kanga Camp. Over at Hwange National Park, the largest game reserve in Zimbabwe at almost 3.5 million acres, animal lovers rejoice in their dream safari. The park is home to more than 100 species of wildlife, including an astonishing 30,000+ elephants. I checked into Little Makalolo, an excellent six-tent safari lodge that’s also unbound in setting. A stone’s throw from the parameters is a water hole, a true magnet for elephants. And he wasn’t kidding. One afternoon, my friend Matt and I were guided to a man-made log pile at the pan’s base. No binoculars were needed as a herd of elephants emerged from the bush, tromping our direction and curiously pausing to observe us (the irony!) before proceeding to drink. Out-of-vehicle viewings like this can rarely be duplicated anywhere else. I felt completely safe and never blinked once for fear of missing such an intimate moment. My cozy tent was safari chic, outfitted with netted walls, white cotton drapes, green canvas and timber. The bathroom, almost as spacious as the bedroom, was detailed with copper sinks, an indoor and outdoor shower and all-organic bath products. Predictably (and quite unfortunately), I didn’t spend much time here. Just a short drive away and near another water hole, Little Makalolo had recently built a tree-house, roofless “bedroom” platform equipped with a bed and a separate toilet. The game crew had arranged a sundowner with fresh pizza fired up from their new clay oven as we watched the sunset. As if on cue, a herd of elephants appeared to hydrate at the hole. After the sun dropped along the horizon, constellations such as the Southern Cross (only visible in the Southern Hemisphere) dotted along the sky with such clarity that the astronomy nerd in me quivered a bit. Equally moving was our drive back to camp when we stumbled upon two male lions. We watched them silently with a red spotlight as they prowled into the night. The creme de la creme of safari lodges is Singita Pamushana, built around rock outcrops in Malilangwe Wildlife Reserve. What makes Singita Pamushana truly notable is that it’s owned by the Malilangwe Trust, an organization that’s active with the African Wildlife Conservation Fund. The Trust’s initiatives help support conservation and community development, whether financing a conservation research department or feeding approximately 19,000 school children daily. Pamushana also has a celebrity side. Opened in 1998, the lakeside lodge’s management was taken over by luxury chain Singita in 2007 and, since, everyone from Bill Gates to Michael Douglas has stayed here. Even Zimbabwe’s minister of tourism, Walter Mzembi, who I had the pleasure to meet in capital city Harare, was quick to agree that Singita Pamushana is a safarian’s fantasy lodge. The main lodge with heated swimming pool and separate Jacuzzi sports killer views of the lake and beyond. Friendly staff are ubiquitous and attentive, and the wine cellar offers a terrific selection of South African and rare wines. But the seven villas are the real highlight. Perched on the hilltop, the villas are intricately detailed and ornate with colorful art; various tiled walls; floor-to-ceiling glass windows that harbor fantastic views of the lake; and high ceilings that can make anyone feel quite Lilliputian. The standard villas alone are equipped with two fireplaces, a separate bedroom, a guest bathroom, a mini-bar stocked with freshly made cookies and fruit and a main bathroom that features a deep bathtub, an indoor and outdoor shower and an expansive deck with private plunge pool. On my last night, the other guests and I were driven to a remote area for a traditional barbecue dinner. The staff had easily taken hours setting up the intimate affair as lanterns hung from tree branches, tables were lit with candles and an assortment of grilled meats were served out in the wild, under the stars. Like the other lodges with their own distinctive amenities, the experience was all undeniably luxurious and a true testament to Zimbabwe’s memorable hospitality. The amazing outdoor heated pool at Singita Pamushana.